This blog is all about the book which I have just finished reading and I thought I should share the Gist of the book with all the readers out there. 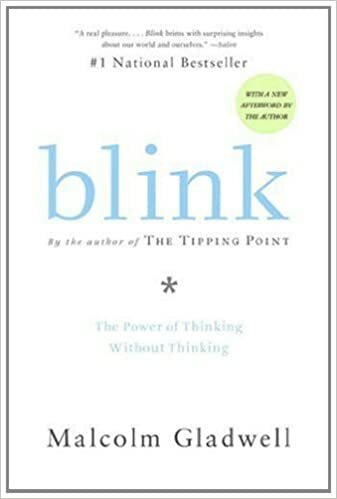 This Book is having a Title “Blink” The power of thinking without thinking, written by Malcolm Gladwell. Blink explores the connection between cutting-edge psychological and neurological research and human intuition. Gladwell uses Blink to demonstrate how someone’s inner self or subconscious affects his or her decisions. I have read one more Book written by same author and I am very much impressed by the writing style of this Author. When you buy something using the retail links from our website, we earn a small affiliate commission. Read more about how this works. “Blink” as the name itself can give you an insight and you can guess in Blink that this Book will be related to something which is not in our control and require fraction of seconds to happen. To give you a broad idea of this book I will start with an example from our Day to Day life and I am very much sure that all of us have been gone through and have experienced the same. : Let me give you a task which will help you to understand it in a better way. Focus your eyes on your finger tip and try not to Blink your Eye Lids as long as possible and then bring your finger tip closer to your Eye Ball and then you will reach at a point where your Eye Lids will blink without asking permission from your so called Supercomputer (brain),. Have you ever thought why this happened? If not then let me explain you. Our genetics and DNA’s are coded in such a way that they have their own brain where everything is stored and they can take decisions without our consent. For Ex. Digesting System, Pumping of blood and so on. But here you will be wandering that what is this Book is all about. Is it based on Medical Science? Or something related to human anatomy? Here I would I like to tell you that this book is based on the same concept. The author has explained all those situations with real life examples where Human Brain can make decisions in a fraction of Seconds without even bothering to include our involvement in taking those decisions. Like we can detect a liar, we can give an opinion about a person in first meeting or we can differentiate things and the list is unending. Here I will left you with a curiosity to find out what is hidden in the rest of the pages of this Book. But to make decision one should have an expert knowledge and should have spent years in practicing that knowledge. Gladwell Explained.